My fave travel-gal Mish and I are off to Asia again in April (we did a trip around Singapore, Malaysia and Thailand 2 years ago in March) and this time, we’re spending two weeks exploring the fascinating Cambodia. Since I can’t lug my jewellery bench along with me, that means that Epheriell will be closed while I’m away – as well as a few days beforehand so I can make sure I have time to catch up on all outstanding orders before I leave. Basically – if you want anything Epheriell before the beginning of May, you need to order NOW! All orders made before I close up my shops on the 4th will be finished and shipped before I go. I will have very limited internet while I’m over there, so if an issue pops up while I’m away (for example, you receive your ring but realise you’ve ordered the wrong size), please just bear with me – send me a detailed email and I’ll get back to you and we’ll sort it out when I return, on April 25th. I’m vaccinated to the gills, and really looking forward to exploring a brand-new-to-me country and culture. Have you been to Cambodia? I’d love to hear your top recommendations! 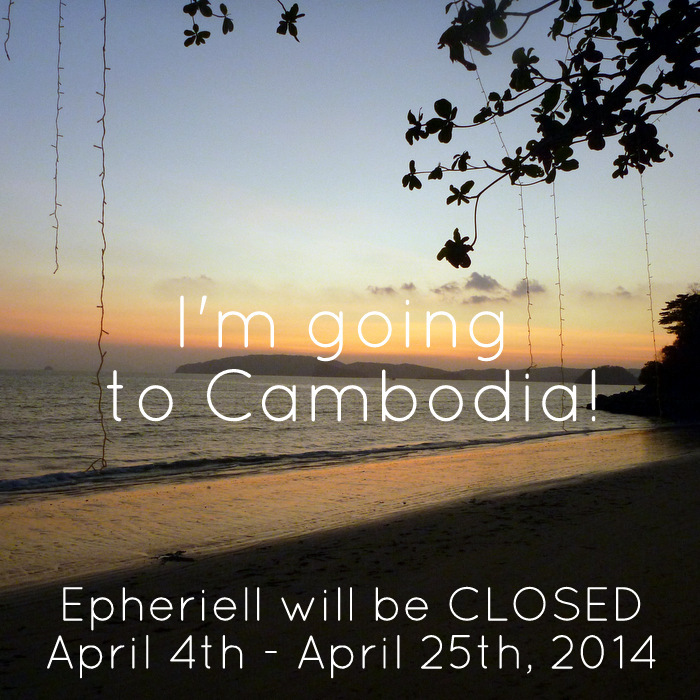 We’ll be visiting Siem Reap, Phnom Penh, Sihanoukville, and one of the islands off the coast, too. If can go to Battambang go, if for no other reason but to go the circus there. It is amazing group of kids who were so entertaining and delightful that we nearly stayed another night to go again. You will be blown away by Angkor, truly amazing. We did a bike tour of the area, great way to see the temples that most tourists don’t make it to. I will see if I can find the details. They were aslo a not for profit org, helping kids get off the streets. A Boat trip along the river fro Siem Reap to Tonle Sap is fascinating. Up close and personal with river dwellers ( floating farms with livestock and crops!!) and floating villages. Enjoy. You will love it. We had a personal guide through Siem Reap, a young guy, local, who was a Uni student who was fascinating. Told us some amazing stories and historical facts. Good thing about that is that you can ask them what you are interested in, not just get the tourist blurb. And yopu go where you want, when you want.